This quote really stuck with me and this can be applied to any aspect of life. With fitness the motivation to go is there, but staying dedicated to your fitness journey is the difficult part. You can want to show up all day long, but unless you actually get into your car and show up, and put in work that #motivationmonday post doesn’t matter one bit. Motivation is what starts the act of change, but dedication is what produces the results. Words of encouragement can keep me going in a workout, as well as others’ expectations of me. If I am not really in the mood to workout, but am greeted with the expectation to do well, then I will push harder. Even during the workout when someone notices I want to quit and makes a comment for me to keep going, it helps. During my workouts, I constantly have an ongoing monologue. Friday it was ‘you only have to do this 4 more times and you can stop’ then ‘just 3 more times, stop resting so much’ and so on. Sometimes it is out loud, if I can breathe to talk…but usually it is in my head. The encouragement, expectations, and even my own monologue help, but that isn’t what gets me to show up day after day. Discipline comes from holding yourself accountable after the fire is gone. If you are disciplined in your journey you will see results. 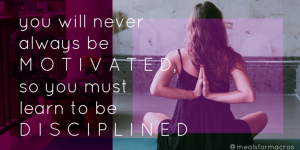 Discipline for me is making healthy choices part of my everyday routine, educating myself on what is healthy, and creating goals for myself. I know that if I don’t go to the gym, simply because I didn’t get enough sleep the night before or because my body is sore or maybe because I am not in the mood, I will regret it later on. I have one chance to make it to the gym everyday and if I don’t take that opportunity every morning, I won’t be going at all. As a teacher, I try to incorporate my students in the process of creating classroom rules and rewards. This gives the students ownership of the rules and rewards, makes them more meaningful, and hopefully causes them to follow through more often on the rules. The same can be said for setting goals for yourself. If you are the one creating the rules, limitations, and goals for yourself you might be more dedicated to them. If someone else is telling you what you can and cannot eat, and what your goals are you might not stick to them as well. You might however, need that accountability piece from someone else to tell you when you are not on the right path to hitting your goals. My motivation waivers from week to week, month to month. I feel like ever since Anderson’s birthday party my motivation has been lacking. Life has just been super busy and draining since then. I have stayed the course though, due to discipline. Without my discipline I would be a big blob by now. Motivation is the fire that gets you going, but that fire dies out and you have to keep going even when you don’t want to. No one wakes up wanting to go to work everyday, but you do because you have to. I see my fitness as a “have to”. I see my meal prep as a “have to”. There is no other option but to go to CrossFit, no other option but to meal prep. I know what the consequences are of not working out and not meal prepping. I would rather push myself through the grogginess of a 5 a.m. workout, than miss my chance and start a bad habit of skipping workouts. Creating new goals for yourself can help keep you motivated too. Once you conquer one goal, set another for yourself. Don’t make your goals unattainable. It will be more beneficial to your self-esteem/confidence, to create small goals that you can accomplish. Making these small accomplishments will keep you motivated and help create the discipline you need to make overall healthy choices for yourself. Stay motivated, but above all else become disciplined in your efforts. Go even when it is a hard day or there are movements you aren’t good at (hello, modify). Meal prep even when you are short on time. Your future self will thank you. In the hopes of the grocery stores having food after hurricane Michael, this is what I am planning to make this week. Can I just say that I am so grateful that I am dedicated to my meal prep, because I was never worried about what we would eat if the power was out for a few days. We had luckily prepared a few soups this week, which made it easy to reheat them on the gas stove and enjoy like the power was never even out! We are praying for those that were tragically hit by the hurricane and are having to rebuild their lives. Needless to say when we heard the power could be out for weeks here in Moultrie, we racked our brains to think of something healthy but easy to eat when the power went out. Last year when the power went out for a little while, we bought a few pouches of tuna. They do make some decent flavored tuna, so it is not the boring regular pouches of tuna. Now that our power is back on, I don’t really care to just eat the tuna, so I am going to make a salad out of it. I love the TOTES toast version of this, but we need to get back to reality after this power outage. Just because I had food prepped for the week doesn’t mean I didn’t bake some cookies at the last minute and I clearly didn’t give enough away because we still have a few left. This salad has everything you need: protein, good vegetables, and carbs. We typically opt out of the green beans, just because Josh doesn’t care for them, but they are a great addition. Don’t get canned green beans, get the fresh green beans. I skip the oil in the dressing so it doesn’t have a lot of unnecessary calories. If you skip the oil in the dressing and limit the amount of potatoes you have, this would be a great salad if you are on a cut or want to eat a lot of food and take in little calories. I was going to go all fancy and do a pineapple salsa over rice, but I decided to keep it simple. Asparagus and wild rice will give us the vegetable and carb we need without over complicating things. The way this fish is prepared gives you a lot of flavor and I don’t like competing flavors, so I am going to let the fish be the star instead of the side dish. This recipe is intended for salmon, which is great because salmon is on sale until Tuesday. We already have amber jack in the freezer so we are going to test it out on that instead. Between the fennel, lemon, chilies, and oranges this is going to be one heck of a combination. The fact that this slow roasts allows me time to prepared the rice and a few other things. I am not going to use the full 3/4 of a cup of oil. They use so much oil to ensure that the fish does not over cook. I am going to keep an eye on it while I prep the other meals so it doesn’t overcook. Only just a few of my favorite things in this dish! Ginger, cauliflower, vinegar…the only thing that could make this recipe better would be a couple of cans of chickpeas to roast with it. I think I will add those too! I love roasted chickpeas, you can season them up anyway you want to and eat them as a snack or throw in with a salad. The fact that this recipe doesn’t call for mounds of oil, makes me so excited. Finally, a recipe that doesn’t overuse oil! There is 1/4 a cup of oil for the cauliflower to roast it, but I don’t plan to use that much oil. I am going to cook pork loin chops with this dish. Pork takes on flavor great and doesn’t dry out as easily as chicken breast, making it great for meal prep. The side dish is the star here, so my meat doesn’t need to be fancy. I like to get a pork loin, because I can cut what I need for pork chops and leave the rest for stuffing later. If you are trying to cut calories or want to eat a lot of volume with little calories, this salad is a great option for that IF you make a few changes. I don’t use oil in my salad dressing, opt for non-fat feta (trust me there is no taste difference), and pick between avocado or almonds to top off the salad. These few changes really make this salad macro friendly if you are trying to cut calories. Remember for every gram of fat there are 9 calories. There is no need to add oil if it isn’t needed and ruin your macro count for the day. With fall approaching you might not be able to find the prettiest blueberries. You can always opt for strawberries or any other kind of berry that you prefer. I ate some of the best strawberries all year, about 2 weeks ago. You had me at sriracha and lost me at eggs. So I am going to do like I always do and change the recipe to fit my taste and macros. Shrimp is on sale right now for $9.99 lb. if you plan to use shrimp. If shrimp isn’t your thing, then chicken breast will work just fine. I am going to use chicken breast so I meet my protein goal without worry. Shrimp is great, but doesn’t offer much in the way of protein. Obviously, I am skipping the eggs, which cuts out a little bit of oil they are using. I am going to keep my noodles separate from the meat and vegetables until I am ready to eat the meal. This allows for me to track my macros more accurately. If I mix everything together I will likely have some portions with more carbs and others with more protein. I like to be as precise as possible when counting my macros. I hope you like this rice noodle recipe. It is a little different than the ones I normally cook, but with a few adjustments I think it will be great!